Two women — one young, the other elderly and pushing an upright shopping cart — paused to look in the window of the California Typewriter Company on San Pablo Avenue. "Typewriters," said the older woman, meaningfully. "Old," said the younger one, before glancing down at her smartphone. It's true; typewriters are old. But their invention, rise, and popular decline also paralleled one of the most transformative periods in modern human history. The newest typewriter in the Berkeley store, a sky-blue Olivetti Studio 46 manual built in Brazil in the early 1990s, might have been made before the younger woman was born. Most are decades older, and it's likely that many of these machines were used at some point by a woman entering the workforce for the first time, as a typist or secretary. The oldest typewriter in the store, a Smith Premier No. 2 with what look like wooden keys, was built in the startlingly retro-futuristic year of 1890, when events like the massacre of ghost dancers at Wounded Knee and the formal end of the US-Indian Wars co-existed in time with mass electrification and the appearance of the first computer — a punch card tabulator used for tallying census data. 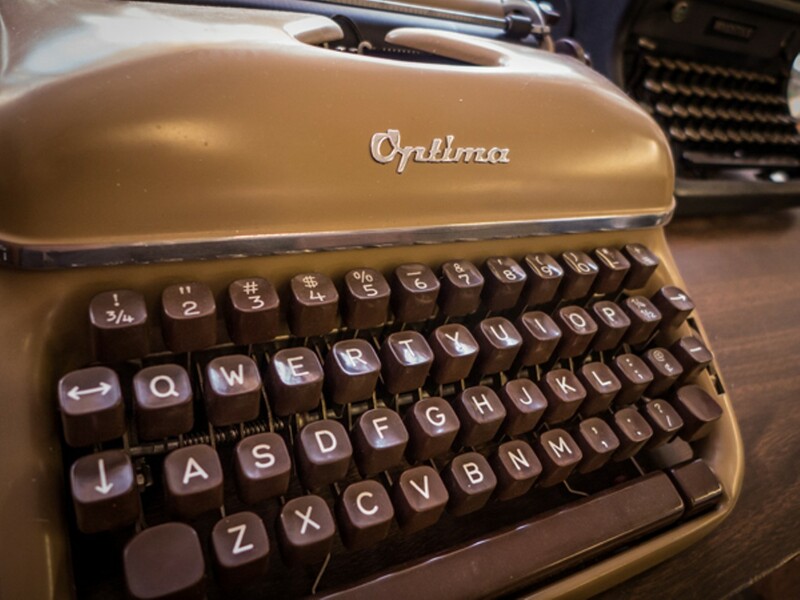 The nostalgic and historic appeal of typewriters is easy to understand. But what's driving the recent revival of practical interest in them? Who's using typewriters, and why? Late last year, dozens of typewriter enthusiasts gathered in Berkeley at the California Typewriter Company — California Typewriter for short — to type, swap stories, and show off their prized Underwoods, Olivettis, Royals, Hermes, Adlers, Smith-Coronas, Brothers, and Remingtons, including one machine from the 1930s that had animals instead of letters on its keys. Doug Nichol, a filmmaker working on a documentary about "the typewriter revival," was there, filming. I asked him why people are using typewriters in 2014 — other than for nostalgia's sake. "I think it's a bit like vinyl, and people taking interest in records," he answered. "You can't beat the sound of an LP, and there is something nice about the ritual of cleaning the record, carefully placing the needle down ... I mean, it's much faster and more convenient to have your music in a digital library or on your computer or phone, but the ritual of listening is not as satisfying. Technology is doing amazing things to make our lives easier, faster, and less effortful, but I think making an effort is what gives life satisfaction, taking the time to enjoy the process of doing something is pleasurable." Another attendee of the SF Bay Area Type-In was Richard Polt, a philosophy professor at Xavier University in Ohio who also curates the blog Writing Ball and the site The Classic Typewriter Page — the latter of which is probably the oldest repository of typewriter history, lore, and documentation on the internet, having been established in 1995. I asked Polt what he thought was behind the recent rise of interest in typewriters. "Here in the 'developed' world," he said, "I think it's people seeking out tools that are durable, independent, private, and that focus the mind instead of creating distractions." This desire to focus our thinking and eliminate distractions is perhaps a recognition of how the mass computer age has dramatically changed the way we think and process information. In roughly a century's time, we've transitioned from writing by hand, pencil-, or pen-on-paper to typewriting, and then to the increasingly ubiquitous amphetamine world of computerized multitasking. The speed, complexity, and efficiency of our writing and communication have increased, but are the actual and potential costs — including bad sleep, memory and mood problems, sexual dysfunction, hypertension, cardiovascular disease, highly toxic e-waste, disposability-by-design, loss of privacy, and an overall diminished ability to engage in linear thinking — worth the advantages? Typewriters aren't some retro-revolutionary answer to the complex realities of the mass technosphere. Their invention and rapid displacement of handwriting were driven by the same forces driving digital technology today. But they've long since been supplanted by computers, and now exist as both symbols and as still very functional, remarkably durable Industrial Age tools of production, largely distinct from those of the Digital Age. "Writing has always been dependent on technology; indeed, in a very literal sense, writing is technology," wrote associate professor Anne Mangen, of the University of Stavange, Norway, and neurophysiologist Jean-Luc Velay, of the Université de la Méditerranée, France, in their 2010 report, "Digitizing Literacy," which explored the "haptics" of writing and focused primarily on the differences between handwriting and typing. "From using clay tablets and animal skins via the medieval manuscript and the ancient papyrus roll, to the mechanization of writing with the printing press and the current digitization, writers have always had to handle physical devices and then apply these to some substrate." Haptics is a field of study that explores the relationship between visual perception and sensorimotor activity. Mangen and Velay's report delved into the implications of switching from writing by hand — a unimanual activity, in which our focus is on the very spot on a page where we're shaping letters we've practiced and memorized — to typing, a bimanual activity, which involves splitting our attention between keyboard and page, and in which "readymade" characters appear on the page with a percussive thrust of a finger. The transition comes at a cost. Research has demonstrated that people who take notes by hand have far greater retention and ability to describe and relate information they've learned than those who type their notes. It's not that typing or keyboarding are "bad," but that our brains have evolved, not as disembodied processing units, but as part of a unified system of embodied cognition, intricately entwined with sensory perception, motor activity, and kinesthesia — the sense that detects body position and the movement of muscles, tendons, and joints. Writing by hand simply uses more of our coordinated body and brain. Of course, human evolutionary merit hasn't been the prime driving force behind changes to human writing technology in the past 125 years. 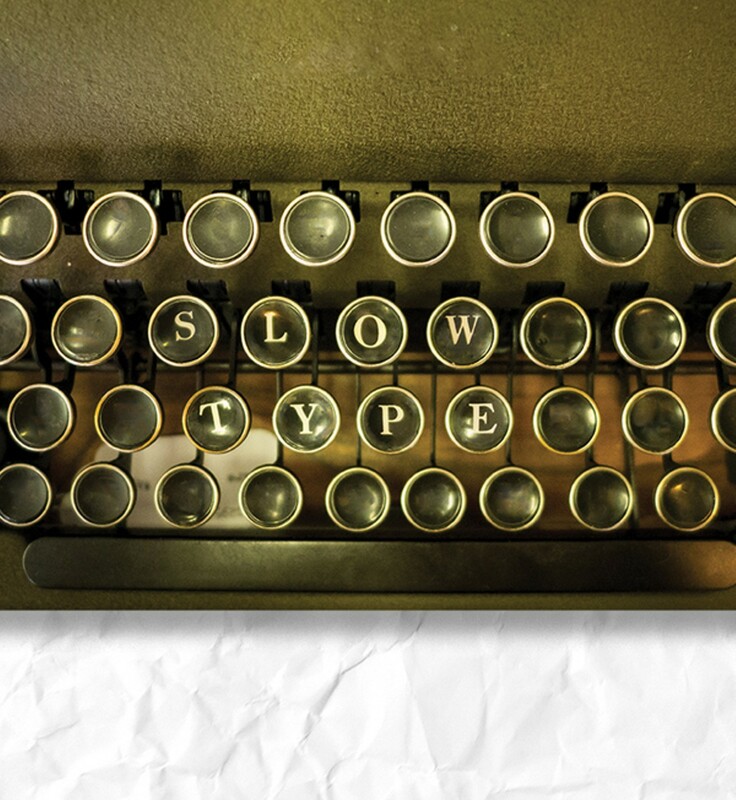 In 2014, typewriters may seem slow, quaint, and inefficient, but from about 1890 until the 1980s, the speed, efficiency, and uniformity they provided spurred the displacement of handwriting for most business correspondence, dictation, and composition. Imagine a rapidly growing industrial society operating without speedy uniform type. Census, tax, accounting, and health-care records — not to mention popular literature and mass media — would all be sorely limited were they constrained by the limitations of handwritten script. Picture the NSA, FBI, CIA, IRS, or some other acronymed agency having to sift through and report on half a billion people's handwritten or typewritten documents. Then consider today's digital reality, of just typing in a keyword or command in order to sort, collate, count, flag, analyze, categorize, or otherwise identify individuals and patterns of behavior on a mass scale. Our writing has become more legible, but as we've evolved from handwriting to typewriting to computer word-processing, we've also become vastly more legible to people, governments, and companies. Typewriters don't browse, stream, feed, log or record, or issue distracting alerts, nor do they allow for multitasking, which frequently blends consumption with production — like buying those coveted hiking shoes on REI.com for your weekend getaway just before finishing that important project for work. The proposition of a typewriter is straightforward: Produce or do nothing with it at all. If you've never written anything on a typewriter, or it's been many years since you have, just try it. You might be surprised by how different it is from working on a computer. "Computers are more utilitarian, necessary devices I need for work and daily living," said Ton Sison, editor of the "i dream lo-tech" blog, in an email. "I get speed and efficiency when I write on a computer, but more deliberate pacing and a deeper focus when I write on a typewriter. It's never been an either-or for me, but a both-and. 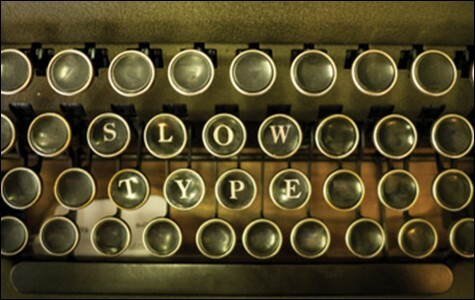 But we live in a fast-paced, distracted world; the typewriter is the speed bump that reminds me to focus. And to think. And then, to write." Richard Polt voiced similar sentiments. "I see different writing tools as appropriate for different purposes. For a personal journal, I prefer handwriting. For a brainstorm or the first draft of a piece of fiction, I find a typewriter ideal. For producing complex text as efficiently as possible, a computer is the best tool, but efficiency isn't always the most important consideration." I picked up my beloved taupe Olivetti Lettera 22 portable for $3 at a weekend half-off sale last year, and it's by far my best thrift score ever. I did an involuntary leaping jig and squawked in the aisle when it happened. In 1959, the Lettera 22 was named the best industrial design product of the century by the Illinois Institute of Technology, and my esteem and affection for it far exceed any emotions I've felt for an electronic device except my first portable music player, which radically improved the quality of long family outings. Despite its elegant design and durable functionality, my Lettera occasionally inserted extra spaces between letters (what's called an "escapement" issue), so I began looking for the nearest typewriter repair shop. A few weeks later, I walked into California Typewriter on San Pablo, where I got the escapement "tuned," purchased a replacement ribbon, and then stayed to chat with the friendly, knowledgeable staff. Shortly after that, I pitched this article to the Express, and had ambitions to compose it entirely by hand and typewriter. As a self-diagnosed (but recovering) internet addict hooked on the little dopamine rushes of pings to my email inbox, trips down the Wikipedia rabbit hole, and RSS-feed-fueled reading jags, and who has written almost entirely on computers for many years, I found it excruciatingly difficult to get my thoughts onto paper in an efficient linear fashion, and ended up writing only about a quarter of this story on my typewriter. My frustration with wasted pieces of paper, cross-outs, and even my own handwriting, which varies depending on mood, speed, type of pen, or sitting position, was enormous. Even on a computer, I can't type as fast as I think, and the widening of that gap with handwriting or typing was maddening, as was not being connected to the internet, where I can quickly check a definition or synonym, or look up a date or piece of background information. Writing on a typewriter forced me to confront just how computer- and internet-dependent my writing and thinking process has become, and how radically my ability to focus on one single thing for a long period of time has been diminished. And I hadn't even noticed these things were happening. One unexpected result of these suddenly self-conscious explorations was that I moved my computer-based writing to a tablet with a highly sensitive stylus and pressure-sensitive screen — much like the graphic tablets employed by digital illustrators. I write by hand on it, and can easily outline, annotate, and mark-up documents, which I can also manipulate in various ways using just my fingers. It has an attached keyboard, but my interaction with the text I produce is not solely dependent on it. The web pages I need are ferried to the tablet on a thumb drive; my writing device doesn't "touch" the internet or its potential invasions or distractions. In a 2011 book that explores not just computer word processing, but the internet in general, The Shallows: What the Internet Is Doing to Our Brains, author Nicholas Carr wrote about a broad shift from what he calls the "linear mind" to one that seeks and constructs information in "short, disjointed, often overlapping bursts — the faster the better." "For the last five centuries, ever since Gutenberg's printing press made book reading a populist pursuit, the linear, literary mind has been at the centre of art, science and society," Carr wrote. But is our tech-accelerated migration from linear to multilinear thought really a bad thing in and of itself? Or are computers just closing the gap with the unrivaled speed and complexity of human cognition? In a recent Nautilus magazine article, "The Pleasure and Pain of Speed," Tom Vanderbilt posed these questions: "Is our ever-quickening life ... an uncontrolled juggernaut, driven by a self-reinforcing cycle of commerce and innovation, and forcing us to cope with a new social and psychological condition? Or is it, instead, a reflection of our intrinsic desire for speed, a transformation of the external world into the rapid-fire stream of events that is closest to the way our consciousness perceives reality to begin with?" "As we have shifted from manual typewriters to electric to, finally, digital tools, [Thompson] ... cites the research of Stanford University literary scholar Andrea Lunsford, who has examined freshmen entrance essays from 1917 until the present. While grammatical error rates have stayed the same, the length and complexity of the essays have dramatically increased. 'It's not that the kids of 1917 were stupider,' says Thompson. 'It's just that their tools were getting in the way of their thought.'" Thompson also refers to "transcriptional fluency," which is basically how fast our writing is compared to our thought process. "When the speed at which you're having your thoughts and utterances can't be matched by the speed at which you write, you might have an idea or way of saying something that never comes back, which is important." Although the positive and negative impacts of some aspects of computer technology are debatable, other aspects of computer use are not. Most people are aware of computer-related eye-fatigue and repetitive-stress injuries (though "scrivener's palsy" was a serious affliction when copies of manuscripts were written out by hand and neurological disorders involving hand cramping and loss of control were common among typists.) But fewer know of the huge influence artificial light — especially the concentrated light of our illuminated monitors and displays — has on our biological clocks, even though scientific research on these effects dates back nearly two decades. A 1996 study, for example, by Dr. Charles Czeisler, professor of Sleep Studies at Harvard Medical School, reported that even modest exposure to artificial lighting at night altered subjects' circadian rhythms, and shifted people's sleep cycles by several hours. Circadian physiology, the system by which organisms synch up with natural cycles of night and day, holds sway across every branch of the biological tree, influencing animals, plants, fungi, and even some bacteria. Illuminated monitors are firing light directly into our eyes, and the light in the blue part of the spectrum, which most closely mimics sunlight, is particularly disruptive. A 2011 paper delivered by researchers at the Centre for Chronobiology at the University of Basel, in Switzerland, reported that the impact of LED lights, with their shorter (blue) wavelengths, had significant effects on the production of melatonin, a key regulator of circadian physiology, which also affects cognitive performance, alertness, mood, memory, cardiovascular health, aspects of sexual function, and even the body's ability to resist several kinds of cancer. Many other studies conducted by respected institutions corroborate these findings. A 1998 article in Science magazine even reported that these light disruptions aren't limited to what our eyes are exposed to, and indirectly suggested that we're more like plants than we realize: the application of light to the back of subjects' knees was enough to alter their circadian clocks. It seems we are sensitive to an entire array of light-based time setters, but still don't understand fully how many of these work, or how much we're affected by artificial light and a technosphere dominated by information systems designed to blast light into our eyes and faces. For all of the speed/efficiency/uniformity-über-alles focus of the evolution of our writing technology, one suboptimal feature has remained constant since gun manufacturer Remington introduced it in some of the first typewriters brought to market in the late 1800s: the QWERTY (or Universal) keyboard. This keyboard layout — which separates common letter pairs — was invented to prevent a typewriter's mechanical typebars from jamming. This means a typist's fingers travel farther than necessary, and that a day of heavy typing might involve extra miles of needless finger travel. To find out more about the past and present of QWERTY alternatives, I contacted Bob Teo, a Singapore-based entrepreneur with operations in London and China, and a former educator with the Singapore Ministry of Education, who has been trying for years to gain traction for a more efficient and ergonomic alternative keyboard known as abKey. I asked him how he got started challenging the QWERTY monolith. "In the late 1980s I was a student in the US, confronted with the requirement that I had to type my assignments — in Singapore we just wrote by hand," Teo said. "Although I had been using a typewriter and keyboard before, I wasn't a proficient touch-typist, so I often had to write my papers 'til late at night. Initially, I blamed myself for not having learned typing. But one day, at the office ... I saw many of my colleagues, some much older and quite experienced, also struggling away at the keyboard — two-finger typing, etc. I then came across a study that showed that up to 85 percent of US computer users had problems with and needed help with keyboarding. Intrigued, and beginning to suspect that it was at least partially the machine and not the user, I began to research QWERTY." The alternative keyboard layout Teo eventually developed situates most letters in alphabetical order, places A, E, I, O, and U directly under the left hand, and the most common consonants, R, S, and T, along with the most commonly used function keys — space and return — under the right hand, in a natural arc instead of in a straight line, which reduces finger travel and fatigue, and thus, the risk of repetitive stress injuries. The overall keyboard layout is in a V-shape, to prevent ulnar deviation, a significant precursor to many carpal tunnel injuries. When I asked Teo about the history of resistance to non-QWERTY keyboard layouts, he surprised me by explaining that, during the early days of typewriters, "resistance came from the main users — the secretaries and typists — because QWERTY, being difficult, and requiring special training, gave them an advantage in terms of better pay for themselves and a barrier of entry for those trying to get into their lines of work." This was also a factor in why the seemingly confounding design of early "up strike" typewriters — which printed text on the bottom, non-visible portion of the platen and paper, requiring great operator precision and considerable short term memory ability — lingered for decades. The thinking was that typing quickly and accurately was a skilled trade, and many managers thought that any typist worth his or her salt shouldn't need to constantly be looking at the page to verify typing accuracy. It's doubtful many people today could type at all on a machine that didn't show them the letters they're typing. Teo also explained to me that "when IBM introduced the 'golf ball' element in its Selectric typewriters, jamming was no longer a problem, but they kept QWERTY because no viable mass alternative existed. When the computer age arrived, the focus was on semiconductors, CPUs, and disk-drives, and the keyboard just wasn't a major consideration. So QWERTY continues to be the standard, not because of any health- or performance-related advantages, but because of pure inertia and ignorance or neglect of these issues." California Typewriter had several examples of non-QWERTY typewriters in the store when I visited, mostly late-1800s machines that never caught on. 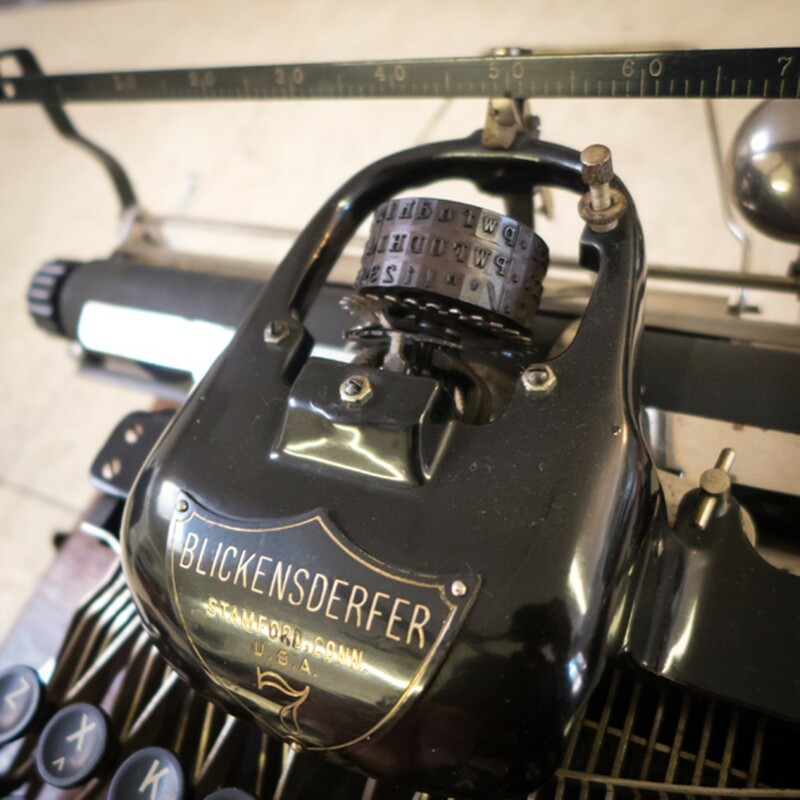 A truly retro-futurist Blickensderfer "single element" machine, one of the first real portables, featured an "Ideal" keyboard layout, an all-mechanical interchangeable typewheel and a complete wrap-around space bar that also serves as a frame. It would look right at home in a Terry Gilliam movie. The home row of keys features the most commonly used English letters — DHIATENSOR. Promoters of the Ideal layout claimed that 70 percent of English words could be typed using just these letters. Carmen Permillion was the first person I met at the shop. She's the daughter of owner Herb Permillion, and she's worked full-time for the business since 1993, though, as she lightly noted, "I was always around, I just wasn't trying to be here full-time." Everyone at California Typewriter is generous with typewriter-related stories and lore, but it was Carmen's initial generosity that hooked me. You may be able to find a great deal on an intact, perfectly functional manual typewriter at garage or estate sales, or at thrift shops, but you should reasonably expect to pay $125 or more for a good working manual typewriter from California Typewriter, and, as with any collectible or vintage item, rarity and prestige carry heavy influence over price. If you want an Olivetti, Hermes, Olympia, or, say, a Groma Kolibri, the portable typewriter featured in the movie The Lives of Others, you'll pay, not just for functionality, but for a distinguished brand name. If you're the type who just cares for functionality, considerably cheaper Smith-Coronas and Brothers are easy to find. "If an Olympia is a Mercedes, a Smith-Corona or Brother's a Chevy: It's good; it's durable; it's simple to work on. It's not as good as the Olympia, but it's not bad at all. 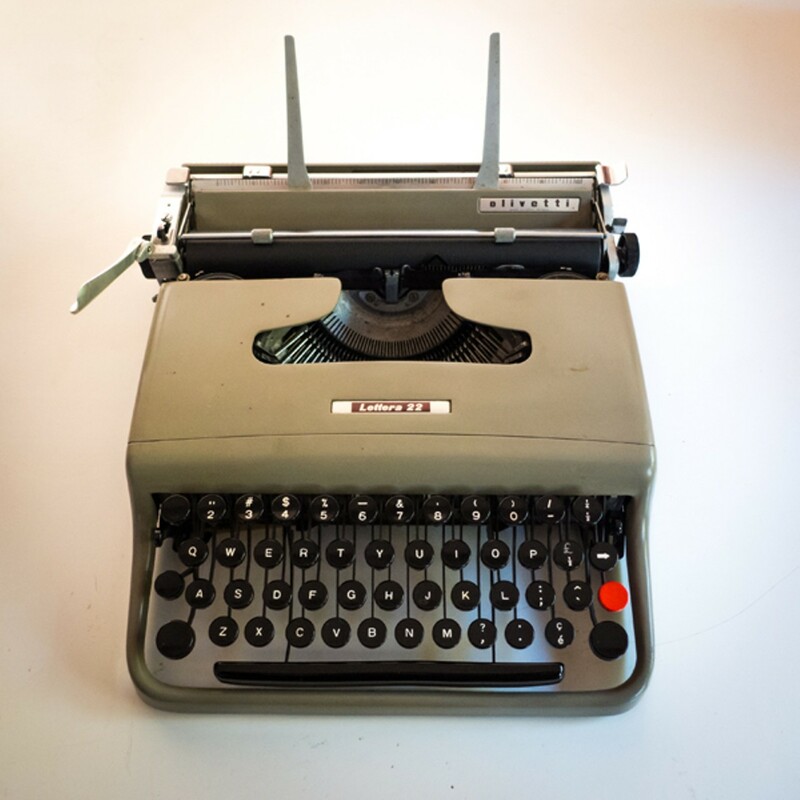 And you can pick one of those up for $125, $150," said California Typewriter's main manual repair tech Ken Alexander, an easygoing man in his fifties who's been with the company since the early Nineties, and worked on typewriters for a decade before that. Before buying California Typewriter and striking out on his own, Herb Permillion worked as an IBM customer engineer at UC Berkeley during the Sixties and Seventies. After twenty years of service, he left IBM, and went into business for himself in 1981, taking most of the university's typewriter and office machine service contracts with him. "IBM, they were probably not happy campers once I left and just about took the whole campus from them, but it was great," he said. "Everything [the university] had, I was able to service, and they were already familiar with my work, so it wasn't really a problem." In 1981, UC Berkeley still had thousands of typewriters on campus that needed servicing, as well as untold numbers of copiers and fax machines. As Herb explained, service contracts were lucrative and steady, and the company's business was brisk. But during the Eighties, many departmental typewriters were phased out in favor of a general university "typing pool," in which dozens of typists would hammer out copy for professors and administrators. By the mid- to late-Nineties, there weren't enough typewriters left on campus to justify issuing service contracts for them. And ten years after that, the trend toward cheaper and more disposable office machines further eroded the need for dedicated service and repair people. These were lean times for California Typewriter. The last manual and electronic typewriter manufacturers in the country closed years ago, and given that another in India shuttered in 2011, only a few models are still being produced, largely in Brazil and China. Much of what the folks at California Typewriter know simply can't be learned at a college or trade school anymore, and it's easy to imagine a time in the not-too-distant future when perfectly operable typewriters will be discarded simply for lack of knowledgeable repair people. 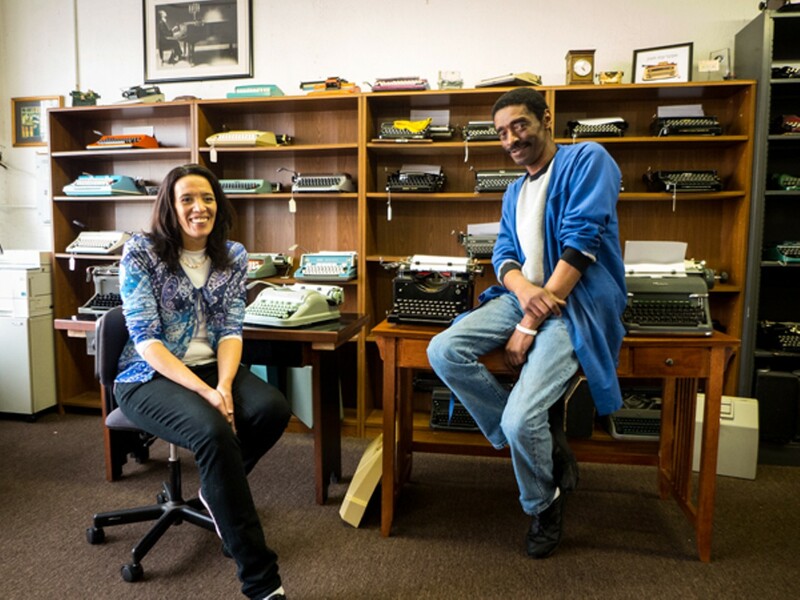 During our interviews, Alexander mentioned the possibility of holding typewriter repair workshops at the store. Perhaps if enough people in the Bay Area express interest in attending these, a local storehouse of practical knowledge can be distributed and preserved. I asked whether sharing such knowledge would be bad for a business. "That's the old way of thinking," he said, chuckling. "All these repair shops around here used to be such ... assholes, who wouldn't share anything. If you needed a part or something, your boss might tell you not to call another store or give them any business. But we changed all that, and started sharing. There aren't too many of us around anymore, so we've got to share! The more people who know these things, the better it is for all of us." California Typewriter enjoys warm relations with Berkeley Typewriter, owned and run by Joe, Jesse, and Jeannie Banuelos at 1823 University Avenue, and Alexander even referred me to his competitor during a search for surprisingly hard-to-find white carbon paper correcting strips. Jeannie Banuelos chatted with me amiably for half an hour while she rooted around for just what I was seeking. She didn't fail, but industrial design did: She located a box of these strips, but they were so old that they turned into dust at the slightest touch. California Typewriter has a website (CaliforniaTypewriter.com) with store history, featured machine profiles, and event listings, but the company doesn't sell any machines online. When I asked why not, Ken Alexander and Carmen Permillion answered with an easy, finishing-each-other's-sentences rapport that comes with having worked together for twenty years. 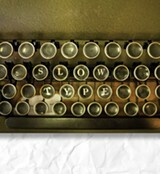 "A lot of people who buy typewriters online really don't know what they're getting!" Permillion began, heatedly. "They may look good, and they may think it's a great deal, but then they get it and it's not working, so they have to spend money to bring it in here to get it fixed ..."
"... like the platen's damaged, or the feeder roll's flat, so it's not feeding paper," Alexander added. "Or we get the ones that didn't get packaged right and the carriage is all off ..."
"We had a guy just last week who spent $300 fixing a Selectric III he'd had shipped to him," Permillion said. "We just want to sell good machines in good working order, and I prefer that people come in and actually type on a machine, then know a bit more about what they want, and what they're getting." Looking around the shop at dozens of working typewriters ranging from 25 to 125 years in age, I marveled at how badly made most modern electronic equipment is by comparison. Even the industrial design of higher-end computers and electronic devices doesn't change the fact that they're toxic to produce, and not designed to last much longer than five years, if that, after which they'll become inoperable toxic waste. Some will then get shipped to developing countries for a reclamation and disposal process that's hazardous to human health and the environment. But even that dismal state of affairs is almost a best-case scenario. Only about a quarter of the electronic devices purchased last year will make it to reclamation. "It's such a waste, how we throw stuff away today," said Alexander. "It's planned obsolescence with a lot of this electronic equipment," he continued, looking around at the various machines, including faxes, copiers, and printers they still repair. "Take some of these printers we work on. You pay what, $100 for them? Who's going to pay $85 to get it fixed? It's made so if the thing breaks, you throw the damn thing out and buy another."